Finger Licking Food: Berrynanalicious ..!!! Yummy goodness! No, I’m not talking about a weird fruit or vegetable but a drink or rather a name for a drink I concocted in my kitchen...hehe! Berrynanalicious is a combination of Strawberries and Banana with milk, sugar and a dash of fresh cream. A tasty delight on a hot summer day! Place all of the above in a blender and blend till smooth. 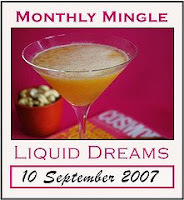 This is my entry to Meeta's Monthly Mingle "Liquid Dreams"
that sound yummy. I will try it out. Thats Yummylicious Namratha. Have a nice weekend. Those strawberries are looking yummy! I have to travel far to buy them in bangalore!Thanks for sharing namratha. Nice one - the drink and the name!